Lean Six Sigma Certification, Training & Lean Practitioner Consulting. An overview of the whole Lean Six Sigma Black Belt Program – all of the Stages (one to three) and Black Belt Certification. The full suite of Lean Six Sigma or Organisational Improvement programs and services are outlined as a context to the Black Belt range of programs. The objectives and competency areas addressed by the Black Belt program are discussed as a means of illustrating on the one hand the value an individual Black Belt brings to the table as well as the value of the unique and practical characteristics of the UTS / LSSBEI program. This Foundation training program outlines the key principles and practices of Lean Six Sigma. It is an ideal introduction for those new to this methodology, or for those keen to consolidate their training and knowledge in this area. Not just theoretical, the Lean Six Sigma Foundations program gives participants an opportunity to test out how the methodology works in a hands-on simulation project. A fundamental success driver for organisations to become high performing, is to build and distribute competency to deliver sustainable improvements inside the organisation. Lean Six Sigma Green Belt training provides the skills necessary to facilitate moderately complex improvement projects and deliver intended organisational results. For the majority of issues within an organisation, people with Green Belt level skills are able to deliver change that is a measurable improvement which can be sustained. 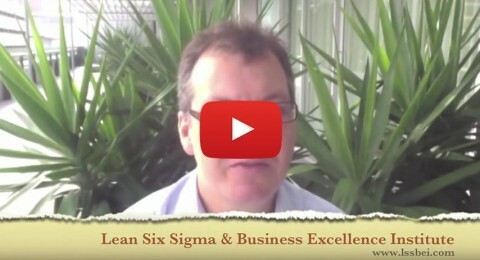 Lean Six Sigma is the globally recognised best practice methodology for business improvement. Lean Six Sigma Black Belt Project Managers are equipped to lead and carry out high-level complex improvement projects across an organisation’s business groups, units and teams. Project Managers will be able to draw on sophisticated business analysis tools, creative solution development techniques and business improvement governance models learned through Lean Six Sigma Black Belt programs. Our Lean Six Sigma Blog presents observations, interviews and news on the Lean Six Sigma, process improvement and training universe.